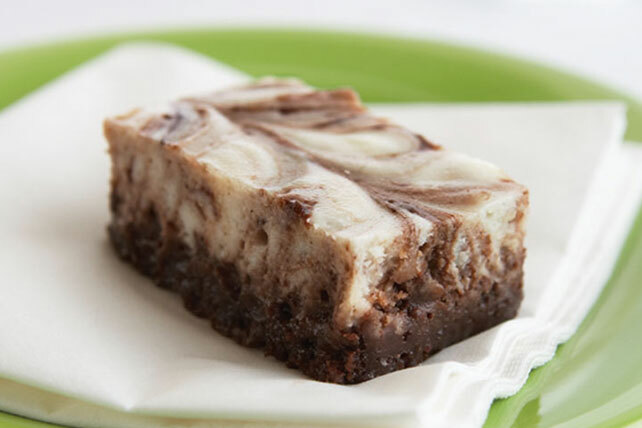 Watch our video to learn how our delectable Cheesecake Brownies are a Healthy Living dessert. They're so good, you'll want to come back for more! Mix brownie mix, applesauce, 2 egg whites and water until blended. Pour into 13x9-inch pan sprayed with cooking spray. Beat Neufchatel, sugar, flour and remaining egg white with mixer until blended; spoon over brownie batter. Swirl gently with knife. Bake 28 to 30 min. or until toothpick inserted in center comes out with fudgy crumbs. (Do not overbake.) Cool completely. Prepare recipe as directed, mixing 2 Tbsp. MAXWELL HOUSE Instant Coffee with the water before using to prepare the brownie batter.